At the moment, I’m juggling a couple of projects, as is my wont. I’m currently revising a recently drafted short story following some useful critique feedback. I’m at the stage where I’ve identified what needs to be tweaked and have just begun the actual tweaking. It’s a fantasy/magical realism piece, and I’m hoping it’ll be ready for submission soon. I like to mix up genres. I dislike boxes and labels, and I often find my stories are hard to classify. Sci-fi ghost story? Why the hell not? Lighthearted adventure caper centred around a fictional genetic defect? Works for me. Classic fairy tale retold as science fiction? Done. And of course, there’s the aforementioned sci-fi-government-conspiracy-coming-of-age story. Fun to juggle. I also find myself placing genuine character struggles in speculative settings. I’ll often have the spark of a fantasy or science fictional idea, and will work it around a character who’s faced with an entirely non-fantastical conflict. Sometimes these are based on personal experiences, sometimes they’re not, but they’re all issues faced by people in the real world. Character is all-important to me, and this is one way I try to make my characters as sympathetic as possible despite the bizarre or futuristic worlds they inhabit. This element probably doesn’t crop up in every story I write, but certainly the majority. I’ve always had an overactive imagination. I’ve always been inspired by massive ideas that aren’t constrained to the world as we currently know it. Fiction is just as fictional when set in the ‘real’ world, so I figure if I’m writing fiction, why not pull out all the stops? Why create only fictional characters when I can create fictional backdrops too? Where speculative fiction is concerned, the possibilities are unlimited. And I hate limits. I’m also an unashamed geek. Why wouldn’t I write sci-fi? My actual writing process varies somewhat, depending on what I’m working on and what else is demanding my attention. I work best with a deadline, which can be tricky when there’s no clock ticking down to an actual moment by which I have to have something completed. So I usually set myself weekly deadlines. I’m good at sticking to them once they’re set. I’ll decide to get a story draft finished by a certain day, or get so many chapters or words written, or get a piece polished up and sent out on its first submission round by the end of the week. That works well for me as long as I actually remember to set myself a target. The vast majority of my writing is done on screen, but every so often I’ll sit down with paper and my shiny fountain pen and scrawl for an afternoon. This happens most often during lovely weather, when I can write outside. There’s something nice about getting back to the basics, and I don’t mind typing everything up the following day, editing as I go. Plus, having ink stains on my fingers feels like proper evidence that I’m a writer. Woo-hoo. There ya go. Some insights into my personal take on the craft. I’m delighted to pass the blog tour onto two marvellous fellow spec fic writers, who will bring you brand new insights next Monday. Be sure to stop by them both next week! ‘Remember Prometheus’ – Out Now! July is here! That means my much-anticipated (by me, at least) story, ‘Remember Prometheus’, is now out in Bastion Science Fiction Magazine. Look! You can purchase e-copies through the website, and there’s a free taster story online to give you a feel for what’s inside. 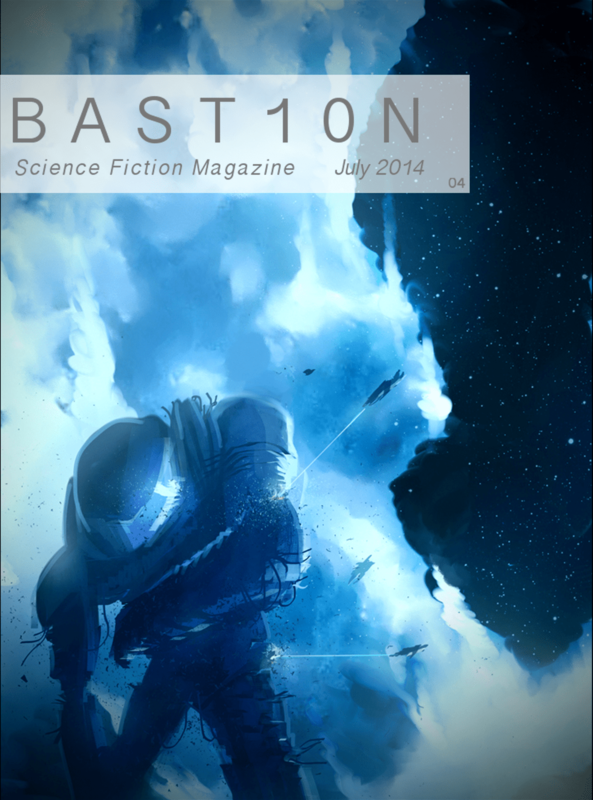 This is only Bastion’s fourth issue, but despite being a fledgling magazine, they’re already getting great reviews and forming a solid fanbase. I sincerely hope they continue to thrive. Their high standards, professionalism, and beautiful presentation make them stand out from the crowd and I’d love to think they have a long and fruitful future ahead. Please help them out by purchasing a copy or subscription if you can. Most of all, though – enjoy the stories!